Last year saw the WITTMANN Group launch many new products in the field of robotics. Now, new in 2017, comes the new PRIMUS 16 robot, the forerunner of a brand-new series. 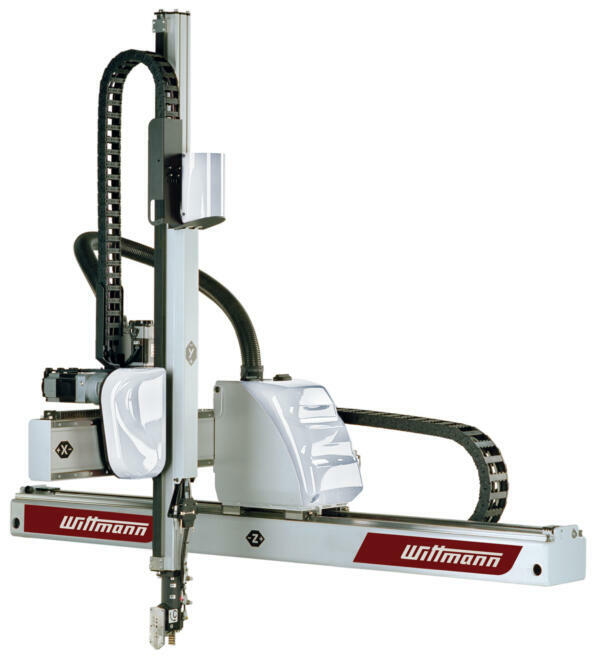 WITTMANN robotics development typically involves the creation of complex and challenging automation solutions. This is clear from the new models of the W8 pro series, and also the software architectures of the R8 and R9 controls, which offer almost limitless extension. With the PRIMUS 16 robot, WITTMANN introduces the PRIMUS robotic series that in the first instance will be used for less challenging pick & place applications. The advance towards miniaturization and the need for part separation without complex automation – these two aspects have nudged WITTMANN to develop this solution. The outcome is the PRIMUS 16, the first robot to fulfill these special requirements. With its payload of up to 5 kg, and with the WITTMANN absolute encoder regulator included, the PRIMUS 16 is very well prepared for these applications. The absolute encoder regulator features in all the smaller WITTMANN robots. The constantly available position feedback – undertaken without preceding referencing – considerably simplifies and quickens the run-up of the process. The mechanical layout and the geometry of the axes of the new device are highly oriented at the high-volume model W818. However, the PRIMUS 16 is especially designed for single removals. Modular design and construction is made possible for the PRIMUS 16. This leads to a much more efficient serial production of the new robot. From the user’s point of view, this leads to lowered cost, and for a system that is proved and tested a thousand-fold. The horizontal axis of the new robot has a stroke capability of 1,500 or 2,000 mm, a vertical axis of either 800, or 1,000, or 1,200 mm and a demolding axis of either 420 or 620 mm. Like all other WITTMANN servo robots, the PRIMUS 16 is programmed using the R8 TeachBox. QuickNew is an essential feature here. It stands for simplified and graphically supported programming. The SmartRemoval and EcoMode control functions come as a standard, as well as the data input via the TextEditor function that already enjoys great popularity.